Vacationers who want to turn a typical beach trip into a grand event will find ample event homes available, in addition to all the services they could possibly require for a memorable time, including catering, music, and rental equipment for extra chairs or make-shift dance floors. If your party is considering turning a standard meeting, gathering or wedding into an Outer Banks affair, then start your search for venues with the wide variety of event homes along the beaches, and enjoy a celebration that can easily last all vacation long. Wedding parties, corporate retreats and family reunions often decide to rent an event home for a number of reasons. One of the most popular reasons is sheer convenience. An event home can offer plenty of amenities that a standard venue cannot, including private kitchens, multiple gathering areas, and most importantly, built in accommodations with anywhere between 4-18 bedrooms located right on the premises. Another big reason why event homes are in demand is location. An event home is almost always located either adjacent to or within walking distance of a local beach or sound, featuring ample access for waterfront events or just a relaxing day at the beach. Finally, event home renters are also enticed by variety and availability. With a growing number of vacation rental homes that allow special events on the Outer Banks, visitors can basically find a home that suits all of their needs and requests, in virtually any OBX area. If these features are attractive to your party, whether you're considering an event home for a wedding and reception, (easily the most popular use), a large scale family reunion, or a corporate event, then the first step is to start browsing. 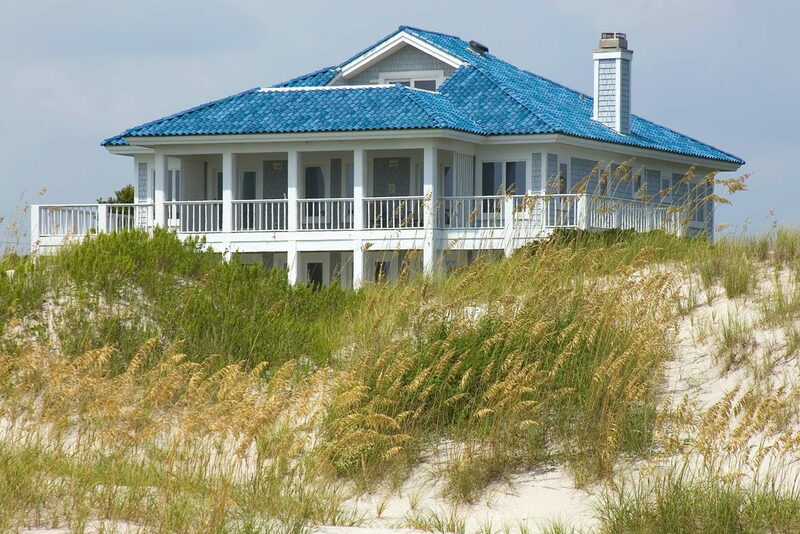 Virtually every property management company on the Outer Banks represents a collection of vacation rental homes that can be used for special events. These homes are located all along the beach, from Carova to Ocracoke Island, and in a variety of areas from soundfront to oceanfront and everywhere in between. Because many vacation rental companies represent homes in a certain region of the Outer Banks, before conducting a search, potential event guests should narrow down their desired area. Be sure and consider factors like accessibility for your guests, and proximity to local attractions or areas that your party would enjoy. For example, Carova is only accessible by 4WD vehicles so transportation for large events may need to be considered, but the beaches along this area are some of the most lovely and undeveloped on the Outer Banks. Also consider proximity to the ocean or sound. Guests who are planning a beach wedding will likely want to reserve an event home that is adjacent to the water, making it an easy trek for the wedding party to and from the home to the ceremony site, while guests who are planning an indoor affair can be more flexible with their home's location. Narrowing down the potential areas can be tricky, but the next step can be equally difficult: determining what size home and amenities you'll require for the event. The sheer variety of event homes on the Outer Banks virtually guarantees that event guests of all genres will be able to find properties that are perfectly suited for their needs, however it can be initially challenging to determine what those needs exactly are. Family reunions will most likely want to search for homes that have ample bedrooms to accommodate all the visiting parties, multiple gathering spaces, (like great rooms, dens, and lofts), as well as fun amenities and rooms that everyone in the family can enjoy, like private pools or game rooms. Corporate planners will want to look for homes with large, comfortable great rooms and living areas, and perhaps theater rooms and media rooms, in addition to high speed internet access and other office features. Weddings and receptions should look for homes with ample deck or living space for guests, multiple kitchens and wet bars for caterers, and a scenic setting by the ocean or soundfront. Some vacation rental companies have an "event home" search feature on their website, allowing browsers to quickly determine and look through the collection of homes that allow large parties and special events. Visitors who have trouble narrowing down the wide range of selections can also contact their local property management company for guidance. Many vacation rental companies have event coordinators on site, or trained guest representatives, who can help newcomers identify the event homes that will suit their needs. Remember, don't be afraid to ask for help - the vacation rental companies are more than happy to guide guests to the perfect event home, in hopes that when they return back for a vacation, they'll return to the Outer Banks. Vacationers should bear in mind that there are a few general rules and regulations that come with renting a vacation rental home for an event, and while specific companies have individual policies, the following overall guidelines should be taken into consideration before and during your stay. Most vacation rental homes, even homes for events, are rented on a weekly basis with a Friday, Saturday or Sunday turnover date, and a weekly rate that varies by season. Partial week rental homes are generally not allowed unless it is within a week or two of your actual arrival. In addition to the standard weekly rate, many vacation homes charge an additional fee and / or security deposit for a special event, and visitors are required to let the vacation rental company know up front that they intend to hold a large event on the property. Failure to do so can lead to eviction and /or extra charges after the event to the lease holder and their party. Be sure and pay attention to the rental home's capacity limits, as this is an essential guideline that is generally determined by both the size of the property as well as the size of the septic system, and not adhering to this number can easily turn a fun event into a sour and unpleasant occasion. The number of people an event home can handle varies widely, but visitors can expect an average number of 40-50 for a single event, (not a week-long stay), and a general maximum of 100 people tops at the largest event homes. In other words, visitors who are planning a large party or wedding of 150 guests or more should consider other Outer Banks venues that are equipped to handle large affairs. Potential renters should also ask their vacation rental company about parking availability, pool use, equipment rentals (like dance floors, extra tables and chairs, and tents), before signing a lease and officially renting a property. Different homes and different communities or subdivisions have varying rules on the subject of parking and equipment, so it's best to be clear about expectations up front. Finally, visitors should use a little plain old common sense during their stay, and make sure they treat the property well. This includes not leaving a mess after the event is over, not nailing or taping décor to the walls, and not excessively rearranging or removing furniture. It sounds obvious, to be sure, but visitors would be surprised how many folks get a little wild while planning a beach event. Clearly, the best resource for all of the rules and guidelines is the vacation rental company itself, so be sure to communicate with your company's event planner or guest services representative well before your stay. By doing so, visitors can ensure that their upcoming event is nothing but good times and smooth sailing. Once the event home has been chosen, the next big question is where to hold the event itself. Many visitors go the event home route because they are virtually guaranteed an indoor substitute in case their outdoor event is derailed by rain or bad weather. For example, a small beach wedding can easily be moved to a large great room if the rain starts to fall, and a family beach barbecue can turn into a pool party if the beach is too blustery. In other words, visitors who intend to hold their event outdoors should make sure that their event home can accommodate their party as well, just in case the weather does not cooperate. The most popular indoor locale for virtually all events is an event home's great room, as it is easily the largest gathering space, and generally takes up an entire floor of the rental home. With ample room for everyone, (and also some of the best views in the house as well as deck access), a spacious and well-appointed great room can serve as the perfect backdrop for any Outer Banks event. Poolside and outdoor decks are also popular event locales, both for the extensive views and the ample room to hold small parties and gatherings. An expansive pool deck can easily be turned into the site for a fun affair with the addition of a few tables, chairs, and a little décor, and considering that most event home pools are often steps away from a game room's wet bar or kitchenette, the proximity can make it easy for food and drink service as well. Outside of the home, the Outer Banks world is your oyster, and there are no shortage of locations a wedding party or family reunion can go to have a fantastic outdoor celebration. Many family reunions and wedding parties like to hit the beach for an oceanside event, although visitors are encouraged to read up on the local guidelines beforehand, which vary by region. For example, wedding parties must have a special use permit before having an event on the Cape Hatteras National Seashore, (which runs from Bodie Island to Ocracoke), which can be obtained from the National Park Service either in person or online before the event. Excessive set-up and decorations are generally not allowed on the beach, but for most couples who want a quiet, oceanside affair, this provision is no problem at all. A selection of event homes also have extensive grounds that can perfectly accommodate weddings or parties of all sizes, and serve as essentially a private retreat for guests. These homes can often be found adjacent to soundfront beaches or wide canals and docks, allowing guests to celebrate next to the water without adhering to local or National Park Service beach regulations. Ask your vacation rental company for suggestions on event homes that are more reminiscent of a private resort for ample accommodations and plenty of space to spread out. Regardless of party size and theme, the event homes on the Outer Banks can clearly cater to any celebration, in any venue, inside and out. Plan your site carefully, and be sure and make accommodations for the off chance of a rainy day, and you're sure to find and reserve an event home that will be enjoyed by everyone in your crew. With the arrival of event homes came the arrival of event home services, and today guests will find an array of vendors that cater specifically to events and celebrations at vacation rental homes. Caterers and private chefs that specialize in home service on the Outer Banks are now common, and can be found in or travel to virtually any Outer Banks area. Using the kitchens and wet bars available at hand, and bringing along additional equipment as needed, these chefs and caterers can accommodate virtually any size party before dismantling their chafing dishes and equipment, cleaning up the kitchen, and leaving their guests full and satisfied. Local rental equipment businesses can also turn a casual event into an elegant affair, with tent, table, chair and even dance floor rentals available for vacationers. For larger events, many of these companies also offer delivery, set-up, and take-down services, so that all a visitor has to do to set up an event is place a phone call. Some local salons, spas and masseuses even offer "at home" services, allowing a bride to look her best on her wedding day in the comfort of her own event home bedroom, or just letting the bride and groom to enjoy a nice relaxing and in-home massage to calm their nerves before they say "I do." In short, there are literally no shortage of services and supplies that can be delivered to and enjoyed at an event home, and parties will find they have access to the same great amenities that other venues along the Outer Banks enjoy. Ask your vacation rental company for information, or contact the Outer Banks Wedding Association for more information, and you're sure to turn your rental home event into a five star affair. Oceanfront beaches and homes are a popular first choice for many weddings and family reunions, however event planners should also consider soundfront accomodations when reviewing their options. A soundfront beach is often located privately on the property, ensuring a quiet and scenic local, and an evening wedding can be a romantic affair with a sound sunset in the background. Generally less breezy, and with less town or National Park Service regulations to consider, a soundfront beach wedding is becoming a popular venue for couples on the Outer Banks. An event home can certainly accommodate the primary guests with on-site bedrooms, however events that may have more attendees than bedrooms should look into rental homes that are close to local motels, inns and bed and breakfasts. Often, a local Outer Banks inn or hotel will offer parties a special group rate for blocks of rooms, and many of these accommodations can be found within easy driving or even walking distance of event homes. Because the majority of vacation rental homes on the Outer Banks are Saturday to Saturday or Sunday to Sunday rentals, visitors should consider holding their event on a weekday to allow them plenty of time for set-up, and plenty of time to relax afterwards. For an event that is being held on a Saturday or Sunday, a two-week rental will also provide the event planners with ample time to relax before and after, not to mention, ample time to explore the Outer Banks and lounge on the beach. If your event dates are flexible, consider renting an event home in the shoulder or off-season months, particularly if you plan on having an indoor celebration. Many vendors provide services year-round, and the weekly rates are generally noticeably cheaper in the off-season months when the weather is still enjoyable, but overall tourism is down. In the fall, winter and spring, the Outer Banks becomes a peaceful and quiet destination, and for many visitors, this atmosphere is perfect for elegant and private affairs. Make sure you reserve your event home well in advance. Rental homes tend to book quickly on the Outer Banks, especially in the warm summer months, and booking early is the best way to have the widest selection of choices. Many vacation rental companies allow guests to book up to a year in advance, so plan early and ensure that you have ample properties to choose from that suit your requirements. Couples who want an in-depth tour of what a vacation rental home can provide for a wedding or special event should plan on attending the Outer Banks Wedding Expo, held annually in January. The expo features a full-day of touring the local venues and event homes along the Outer Banks, and couples will typically find several examples of event homes in all regions of the islands. In addition, vacation rental event planners and staff are on hand at each site to answer questions, and to give brides and grooms a complete overview of the homes that their company offers that are ideal for events. An event home can be the perfect locale for a family reunion, an ocean or soundside wedding, or a corporate retreat, and vacationers are quickly discovering the Outer Banks has one of the best selections of these homes on the East Coast. Ranging from small oceanside cottages to sprawling private resorts designed with events in mind, these properties are ideal for accommodating groups of all sizes, and allowing the event planners to relax before and after the celebration in their own beachside home. When planning your work retreat, wedding, or family celebration, consider reviewing the wide range of event homes on the Outer Banks, and create an event that's unique, tailored to your specifications, and a memorable affair that your party won't soon forget.